I have been sick all week and when I am sick, I desperately want a bowl of noodle soup (be it pho or ramen). I dragged myself into work on Tuesday because I had court but once it was over I headed straight to the nearest noodle shop I could find, which happened to be Shabu & Mein. The restaurant is small, but sleek and trendy, befitting for its location on the outskirts of Kendall Square near the Cambridgeside galleria mall. On the specials board, there was a big sign for “Crazy pork ramen” and I inquired what made it so crazy. The waiter explained that the ramen had three pieces of char siu, three pieces of pork belly and six pieces of tontoro (fatty pork). If that’s crazy, I don’t wanna be sane. Given the description, the bowl was smaller than I expected, but all 12 pieces of the aforementioned pig were present and accounted for. 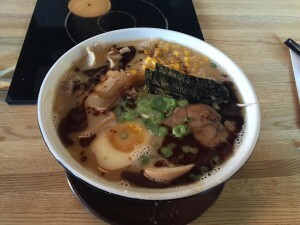 The tonkotsu broth a good flavor, and the soft-boiled egg was perfectly cooked, but the noodles were all wrong. They were thin and white and I wanted the medium springy noodles. The $18 price tag will probably keep me from coming back, but it did hit the illness spot at the time.